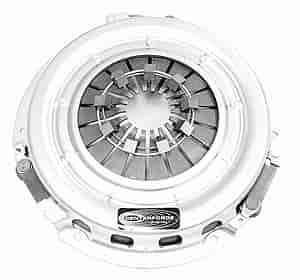 HD diaphragm type with centrifugal assist. Has approx. 25% more capacity than stock Mustang unit. Cast iron plate. Fits all 1986-01 Mustang GT, 1993-98 Cobra with T-5 or T45 Transmissions. 2001-04 Mustang GT with 3650 transmission and 1999-03 Cobra uses an 11" clutch. OK to mix and match Ford Racing clutch discs and pressure plates but do NOT install a FRPP pressure plate with a stock disc or vice-versa as disengagement problems may occur. Installation of 10.5" clutch assemblies on 1979-85 vehicles equipped with 10" clutch requires new flywheel. Metric fasteners and dowel pins must be used with 10.5" clutches. Requires metric pressure plate bolts N602549-S51M and alignment dowel pins D1FZ-6397-B. Ford Racing kit 397-M-6397-A302. Ford Racing has designed their clutches for Mustang owners that ride their pony harder than what the factory clutch was designed for. If you are running all the popular bolt-on go fast parts and going drag racing or attending track day sessions with sticky tires you may need more hold than what the factory clutch can offer. Designed to handle 25%-40% more torque than stock clutches and providing the reliability and quality you have come to expect from Ford. Ford Racing clutches are one of the best choices in replacement clutches for the money.